Glitter always sounds good until I try and take a picture…LOL! Another card celebrating the 200th CAS Challenges over at Splitcoast. Jen has asked us to use SU! Very Vanilla, Crumb Cake and Real Red and to add sparkle for one challenge, to use ribbons and bows for another, and to use our favorite holiday song for another. Check, check and check! I’ve embossed the background with stars and then covered it in glue and added SU! Dazzling Diamonds glitter for sparkle. Next a big red bow made with my Becca Peg Bow Maker as this stamper is bow challenged. Then, a tag cut with the Verve Sweet Scallop die. It’s been stamped with the sentiment and lots of little stars randomly over the tag. Next, the edges were sponged with the Real Red. I added a button to the center of the bow and looped some twine over it to tie the tag onto the bow. Some little bits of Scor-Tape hold the ties of the bow in place around the tag. How beautiful! This is so lovely and perfect for Christmas! What a wonderful way to remind us of the words to that gorgeous song. I'm glad you listed the products you used because I always forget to buy a glitter cloth (my craft room is currently covered glitter so I really should have read your post earlier!!). Loving the sparkle and that big red bow! 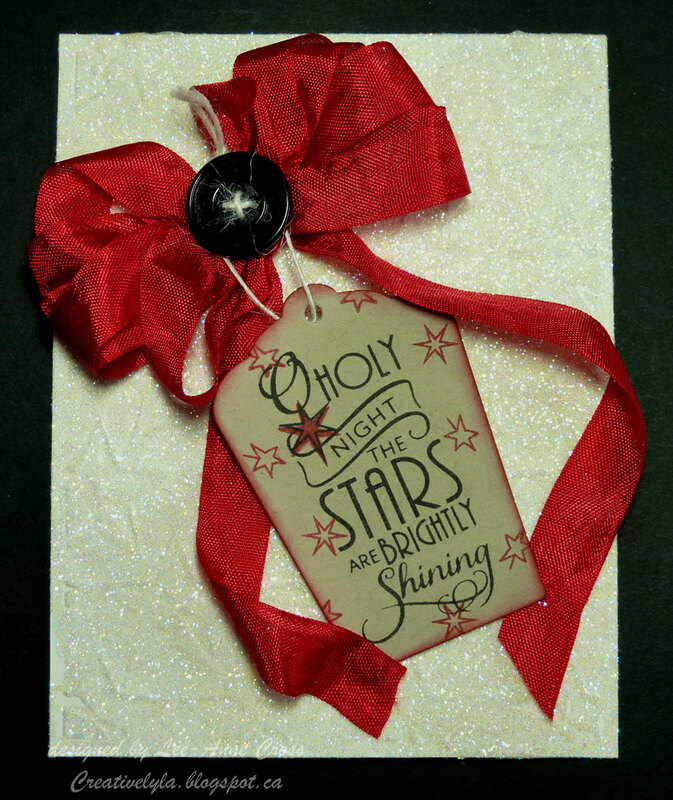 Even better, a phrase from my favorite Christmas carol. Oh yes – I can see sparkle and it's fabulous!! Love your amazing Bow and tag as well! !